The Tees Valley Mayor and five Local Authority Leaders following the meeting. From left, Coun Bob Cook, Coun Christopher Akers-Belcher, Tees Valley Mayor Ben Houchen, Coun Stephen Harker, Coun Sue Jeffrey and Middlesbrough Mayor Dave Budd. A Hartlepool Borough Council chief said this is 'the most significant day in my tenure as leader' as the Tees Valley Combined Authority Investment Plan - which includes the takeover of Durham Tees Valley Airport - is passed. Tees Valley Mayor Ben Houchen says it’s a “truly great day for Teesside” as the plan outlining spending of £588m over the next ten years within the Tees Valley, including programmes in Hartlepool, gets the go-ahead. Mayor Houchen said the decision is “greater than one person” and will define Teesside. “It cannot be underestimated the decision we are making today is - it is seismic,” he added. He stressed the investment plan will offer £55m to help education and skills in Tees Valley. Coun Akers-Belcher added: “It’s a huge investment and we need to invest in my young people - there is a lot of tugging at the heartstrings around the airport and I agree with it completely but my role is to help young people. It includes backing plans in Hartlepool including the Hartlepool Waterfront scheme, with up to £20m support. Transport schemes include New Tees Crossings (West and East), the Hartlepool Western Growth Corridor and A689 Wynyard Improvements. Local rail network improvement projects for consideration in the plan include Hartlepool Station Platform Capacity and Billingham Station Accessibility schemes. 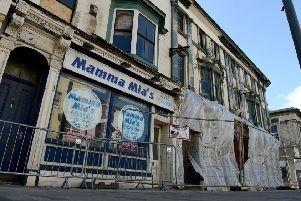 RELATED CONTENT: Councillor Christopher Akers-Belcher, the leader of Hartlepool Borough Council, said last week that he plans to support the plan. RELATED CONTENT: Tees Valley Mayor says he is in ‘touching distance’ of bringing Durham Tees Valley Airport into public ownership. The authority is looking to spend £40million to bring the airport back into public ownership. The deal includes buying Peel’s 89% shareholding in Durham Tees Valley Airport (DTVA). The other 11% is owned by six local authorities, with Hartlepool Borough Council owning a 1.08% stake in the airport. A spokesman for Peel Airports said: "We welcome the decision of the Tees Valley local authority leaders to support the proposal by the elected mayor to create a business plan designed to develop the economic benefits of the regional economy and its communities, by securing the future of Durham Tees Valley Airport. "We have been working hard with the mayor to ensure a smooth transition once the sale has been concluded. Following today’s decision, we will continue to work with the mayor and the Combined Authority to assist in completing the process."